If you remember, we decided to take some of our meager savings and buy some extra food for storage. We didn't get everything on our wish list, but we got a lot. We're "rounding out the corners" in terms of our preparedness efforts, and we wanted to lay in extra amounts of things we felt might be going up in price shortly: luxuries such as sugar, chocolate chips, and cocoa powder; but also some extra staples such as black-eyed peas, oatmeal, cornmeal, and rice. Especially rice. We are huge rice eaters and rice is something we can't grow ourselves (unlike wheat). If I had my way (meaning, if we had the money) I would have literally a ton of rice stored away, though we have nowhere near that amount. White rice stores very well if properly prepared. Which begs the question - how do you properly store rice? Here's what we did. It all started a couple months ago when we got two food-grade barrels. We wanted these larger containers for - ta da - rice storage. Once we had the barrels, we needed barrel liners, which are essential giganto-sized plastic bags. These types of barrels are used to transport such things as olives or anchovies or other (ahem) stinky things. The smell within the empty clean barrels can still be pretty strong. Thick food-grade plastic liners are available online, though we ordered them from a local source. The next thing we needed was diatomaceous earth. There are two basic types of this material: food-grade (used for insect control in grain storage) and non food-grade (I think it's used to help keep swimming pools clean or something - not sure). It goes without saying we purchased food-grade diatomaceous earth. The non food-grade can poison you. Diatomaceous earth works for insect control by scratching and damaging the waxy outer coating of the insects' exoskeleton. This means the insects are no longer water-proof, so to speak, and they will dehydrate and die. If you do an online search for food-grade D.E., you'll doubtless find many sources. We bought fifty pounds for fifty bucks (that included shipping) and practically have enough D.E. to power the neighborhood. To mix the D.E. with the rice, we cleaned out one of our sturdy plastic 25-gal. farm buckets. We poured the rice and D.E. in simultaneously. This proved to be such a dusty procedure that thereafter we moved this outside and wore a dust mask. ...and poured the rice, bag by treated bag, into the barrel (sorry, no photos). A barrel this size, we learned, holds about 375 lbs. of rice. Next step: remove the oxygen. I purchased oxygen absorbers at the Mormon cannery, 100 for $0.10 each. 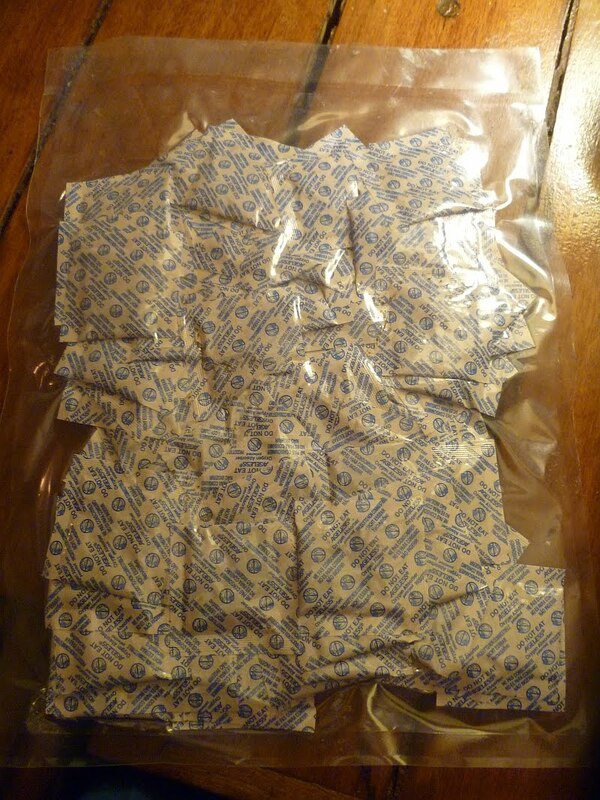 We placed about 15 of these oxygen absorbers on top the rice and then folded the plastic liner to squeeze the excess air out and seal the bag. Then we taped the liner shut with duct tape and put on the barrel top. The oxygen absorbers will absorb the remaining oxygen from the bag, leaving the rice in an anaerobic environment unsuitable to any insects or other life. The rice is now protected against moisture, rodents, insects, and just about anything else that can be thrown at it. Stored in this way, rice will stay good to eat for many years. Dried foods can also be stored in plastic food-grade buckets with gasketed lids (I get mine at grocery store bakeries). Line with Mylar bags, toss in some oxygen absorbers, seal the bags, put on the lids, and again you have food that will last for years. Well I never worked that hard with DE. I just sprinkle a bit in my buckets. I can imagine you are bloody safe against infestations of any type. I'd never accuse anyone of over kill on food storage. If you are happy, that's what counts. Why not just freeze it? Took stock of my food stores this afternoon and realized I need a lot more, despite adding to it for more than a year. Watching the farm report several mornings this month, seeing the price of soybeans and corn and wheat rising - which will increase the price of beef and pork and chicken - it is abundantly apparent that food prices will be much higher in 6 months. The farm report is for futures, not today's prices. ("Futures" means down the road 6 months to 1 year.) The only conclusion to draw is that food price inflation has just begun to rear its ugly head. Buy now, or pay much more later. Buy now, while there are still abundant supplies available. I've seen similar barrels in the local nursery. They sell them for $18. Is that about standard around the country? The ones at the nursery held olives from Greece. They are 40 gallons, I think. Thanks for posting this demo! We used the gasketed buckets to store our grain, but I've never used DE before so this is a great primer! So thankful for everything you guys share! I was concerned about safety and discovered that food grade DE is safe(er) and the type used in filters isn't. Here is the reference from Wiki with everything you ever wanted to know about using DE as an insecticide in food storage. Rice is a "forever food". Stored properly, like you did, it will last forever, absolutely no expiration! I'm on a search for a couple of those barrels. We can't grow wheat here, so that's what my bulk of storage is in. I assume that you have to wash the rice when you are ready to use it? The only problem I can see is using all that rice before it goes bad. You might think abot storing smaller mylar bags and packing them again when you open the barrels. We store rice with the D.E. in 5 gallon buckets. Also being so heavy it would be very hard to move the barrels when full. I guess you could roll them around! Very smart to buy now, we are, too! Can you tell me where you ordered the DE? Do you have to wash it out of the rice when you use it? From a big dummy here: So when you get ready to eat the rice, do you soak it and then strain it to get out the D.M.? What's the procedure, please? Thanks! So, do you remove the DE somehow when you eat the rice? Because we're out of room in our freezer. Freezing will certainly kill whatever bugs might be in the grain, but it doesn't guarantee that no future bugs will get in unless you pack away the grain right away, which is certainly do-able. Food-grade D.E. is not harmful to consume in the quantities necessary to mix with grain to protect it from insects. (Breathing it is a different matter, as someone pointed out.) So if you were to prepare treated grain such as wheat or rice **without** removing the D.E., it would not harm you. (I don't know if it would affect the taste.) That said, it would take no time to wash the D.E. off rice or blow it off wheat prior to grinding, since leaving it in would add a certain "grittiness" factor to the grain. I have a question for you. I've got my mylar bags and oxygen absorbers and have been perfecting a bread mix. I'm using half whole wheat flour, half bread flour, honey powder, gluten flour (small amount for rising) and I want to pack these away in my gallon size bags. Here's my question. Do you know if I can go ahead and add the yeast to the mylar bags? I've gotten mixed opinions on both ways. Some say it's fine because the yeast is not activated until it's mixed with liquids. Others say the opposite. Help! DE doesn't really have a taste but it will make your food a little gritty. I eat it every day mixed into yogurt and a handful of granola. It's a great source for calcium! When you use it to store grain, beans, etc., just rinse it off under the faucet. Don't work too hard to get it all off cause it will NOT hurt you to eat it. Angela, I would be wary of storing a bread mix in this way, but not because of the yeast (which should be fine mixed in since it won't activate until there are liquids). I would be wary because some of the ingredients you listed have a fairly short shelf life - such as whole wheat flour and yeast. Packing foods away does not put them in a state of suspended animation unless those foods are in a state that maximizes their store-ability. Grains such as wheat and white rice can store for decades. Brown rice has the oils still in it and will store for considerably less time. Whole wheat flour will not store for a terribly long time, yeast even less so. So you can store your bread mix for awhile (I can't give you an exact amount of time) but it's not something that will store for years. Just FYI. I use DE, food grade, for ongoing de-worming on all my farm animals. I mix it into their grain. pigs, goats, and yes even humans. We have treated our bulk seed storage that we hold back from harvest year to the next year for field planting with DE as well. You'd be quite surprized and upset at what amount of damage can be done to corn and grains by bugs just in one year sitting untreated in barrels. I can see that that very thorough DE treatment would kill off entire armies of critters, and that's my problem. Isn't there a way to not let the problem get to such gigantic proportions to begin with? In other words, I'm not seeing any PREVENTIVE action by the DE, just a Critter WMD after the fact, and that kind of creeps me out. I think I must be missing something? Due to a short situation I had here recently I dipped into my pitifully and shamefully small supply of emergency food: in part, B&M veggie baked beans, and ate it right out of the can -- opening them with my p38 and everything! -- and it was DELICIOUS!! Cold!! Yes! That is going to be a normal bachelor dinner from now on! Yeah, yeah, go on with your juvenile jokes about beans making me a permanent bachelor, it was GOOD! Nothing but ONE small spoon to wash! Works for me once in a while! Oh yeah, and you'll never guess where the rice ended up. My closet. Again. At least it's better than the canning jars. I'm not opposed to sharing my food. But I draw the line at uninvited visitors with exoskeletons. If that makes me a rabid speciest, so be it. Besides, all I ingest with my rice is a few million bits of silica. Lord knows what added ingredients you get with each spoonful of canned beans. I just mean I'm all for macroscopic land mines (DE) as a last line of defense against insects, but do you you use any chemical or other means as a deterrence, or do you rely on barrier methods? Put another way, do the critters detect the DE somehow, and head on down the road, or do they just eat and die in the food supply? I am not speaking in jest, as I know NOTHING about this. Thanks, Patrice. Actually the bread mixes are only meant to last a few months to a year. I have more long term foods stored away. It's amazing trying to cram all this info into an old brain at this rate! I'm currently trying to learn about solar ovens. Anyone experienced? You know, I never thought about the fact that I would need bags to store foods...=P on me. This is great information! I've used DE very successfully in my garden. I sprinkled it around and on some things and it helped with bug control. I also sprinkled it on my horse, being careful to keep us both upwind so as not to inhale any, and on his 'meadow muffins' as well. It made a big dent in the fly population. Right now I'm using the freeze and stash method...freezing stuff, in its unopened package, for a week and then putting it in a sealed container. So far so good. PS: I haven't seen any recent posts from our girl Katie in Germany. I was absent for a few days...did I miss something? Have we heard from her recently? She's had a mighty full plate lately and has a loved one deployed in harm's way. Please join me in prayer for her family, won't you? I don't like using chemicals on my food. That's what's so GREAT about DE. It has nothing IN it that will hurt you. As I noted earlier, you do NOT want to inhale it, as it does bad things to your lungs. The bugs don't avoid the DE - neither do they eat it. DE is crushed sea shells. It's almost in a flour form to us. But if you look under a microscope, you'll see that it has sharp edges that work for us by cutting into the protective layer surrounding the insects. When that layer is breached, they essentially bleed to death. Very cool. When you are prepping, your concern is to preserve your food long-term. No wheat or rice in the world is devoid of insect eggs. When those boogers hatch out, it's like a buffet for them UNLESS you treat them to a little DE. =:-) What you're wanting to do with the DE is KILL the little boogers so they won't propagate and over time, eat up your entire storage. Glad you're interested in learning. Ahh....wish I had know about that mylar bag trick! I have 200lbs of wheat with a very strong after taste of pepperonccinis! "The bugs don't avoid the DE - neither do they eat it." I know. My asking about its deterrence value was an attempt to get my point across -- which didn't work. Further explanation available on request. "DE is crushed sea shells. ... it has sharp edges that work for us by cutting into the protective layer surrounding the insects. When that layer is breached, they essentially bleed to death. Very cool." Where do the little buggers die after we've administered the death by a thousand cuts? Right there in the rice? Are there/their little critter carcasses right there mixed with the grains of rice we're going to eat? Again, to Everyone my apologies for being so thick. Yep, they die right there in the rice. But don't worry, it's not as bad as you think. First, you already eat a lot more bug parts than you think. Rice doesn't have any more bugs than any other food. Second, the whole idea of using D.E. is to keep MORE bugs from happening, i.e. bugs feasting on the rice, then reproducing more baby bugs, which will then feast more. In other words, the D.E. safeguards the rice or other grains from proliferating populations. But yeah, the dead bugs will be in the rice. Just pick 'em out if you see them. Tasty though, eh? I'm not squeamish about it -- though others may be -- but I was curious. Thank you, Patrice. Patrice, did you know that at your "Mormon" cannery they sell #10 cans that you can dry pack commodities in? Better for such things that you may not want to open in such big quantities. You still need oxygen absorbers. I like them for powdered milk, salt, baking soda, choc.chips etc. Yes, I'm fully aware of what the LDS (I use "Mormon" more frequently because most folks outside the LDS religion don't know what LDS stands for) cannery sells, but I can get better prices on many things at our local wholesale grocery. I only look at their bulk foods rather than the #10 cans. I prefer not to use #10 cans because (a) once opened, the cans are not reusable; and (b) I think - but I'm not sure - if I wanted cans from the cannery, I have to physically be there helping with the canning, and I don't know if they allow non-Mormons that option. The cannery sells the best quality powdered milk I've found, and it's the ONLY place I can find which sells bulk wheat and their prices are decent. Ditto with oxygen absorbers. One thing I'm impressed about at the Spokane cannery is their graciousness in allowing non-Mormons to purchase food through them. Awfully nice folks! I didn't see one use that we have made more than once with GREAT results. D.E. to be rid of fleas. If you live in the right (wrong?) places and you have critters in your home - you will have a flea problem. So from what I am understanding, I can use the freeze method to kill the bugs instead of the DE method. I have space in my freezer so this would be an option for me. How long do I have to freeze them? Is there any down-side to the freeze method? Once they are frozen they are gone for good right (as long as I don't give new bugs a chance to get into the bucket? )Otherwise, if I open my bucket, scoop out what I need, and close it quickly, I should be safe from re-infestation? Has anyone looked into the dry ice method? Last of all, how long can I store white rice (that has been frozen)in a bucket in a mylar bag? My family typically eats (and prefers) brown rice. But the brown rice does not have a great shelf life. For this reason we would probably not be rotating through our stored white rice. Thanks for providing so much information for those of us that are so new to this. I believe you are correct about needing to be present at the cannery to use their equipment. When I asked, they told me I could use it, but only if I came as the guest of an LDS member. They allowed me to purchase bulk food without this restriction since I drive in from Newport and don't have any Mormon friends. She said they would still rather that you come as a guest, but they were very nice and helpful. She said the policy will stay this way for now, but in the last 2-3 months they have seen such an increase in bulk food purchases, they may need to rethink allowing non-members if it gets much worse. I have to say I was surprised that a group already known to be so prepared would see this kind of uptick in purchases. I wonder how much of the increase is from non-members. I'm thinking about trying DE to control tomato worms, have you had any experience with this? Also, while on the subject of food storage, do you (or any reader who wants to chime in) have any idea how to store potatoes, winter squash, carrots, and similar vegies long term without the benefit of a root cellar? I live in a desert climate in southern California that freezes in winter & bakes in summer. I need to take our preparedness to the next level. I can grow it, but can I store it? Where do you get your food liners from and your food grade barrels? Any barrels we have found are unbelievably expensive and I can't seem to find reasonable (and large enough) food bags. Also, do mylar bags need a sealer, and if so, what kind of sealer? We got our food-grade barrels at a regional (in Spokane, WA) recycling center - I don't remember the name but I know how to drive there, LOL. We purchased our liners from a company north of us called Eagle Peak Containers (http://www.epcontainers.net/) that also sell barrels. About $30/barrel seems to be the going rate. I honestly have never used Mylar bags so I can't answer that question. Perhaps someone else can...? do those barrels have a name ? I have never seen threaded barrels like that,also what size are they ? Patrice, you just buy the cans and lids at the cannery and the "locals" can help you locate the dry pack canner to use. You can't reuse the cans but they come with plastic lids for reclosing. I just like them for those things that are hard to find on a bulk store. I've "canned" dry milk, rice, dried beans, macaroni,salt, and a friend of mine "canned" choc. chips, M&Ms, cocoa powder, dog food, and other such "important" commodities. I feel it's important to be able to provide "comfort" foods especially in times of stress as I see you do as well. I'd like to find out more about vacuum packing glass jars with such things as baking powder and baking soda so they'd be in more user friendly sized containers. I enjoy your blog and "check in" to see what you've had to say almost daily, keep up the good work. What are your plans when you have to start using from this barrel? I haven't purchased mylar bags, would you remove some and then reseal? I worried about purchasing 15# of rice - that we couldn't use it up (2 retirees), but the price is great . Hard to imagine a barrelful. YouTube has many videos about the use and sealing of mylar bags. Also, info on how to use a vacuum sealer and packer. Just type in various search terms at the YouTube site and you'll find the vids that provide step-by-step instructions. Sue, once we would start on the contents of the barrel, we would probably just keep the lid on tight between uses and not re-seal anything otherwise. Keep in mind that if we're using the contents of the barrel, it means we're likely feeding more than just ourselves, but are also sharing with neighbors, friends, extended family, whomever... because it means we're not able to get fresh rice. But rice (well, white rice) will last a long long time if protected from moisture and insects. An open bag inside a barrel with a lid will certainly last as long as it takes to eat down the barrel. Perhaps you can group together your "food preservation" blogs into a link as you did your blogs on survival...as you have answered an awful lot of questions here. As for the other items in your picture above, the sugar and mustard and such, do you take extra measures in preserving them or do you just leave them in their packages...? Perhaps there's someplace that will tell me, a infant-prepper-in-training, just how to get the maximum storage life out of particular items. My apologies for the long-windedness. Much appreciation for your tiresome example of all a rural homesteading prepper should be! When I first began prepping, I bought about 10# of sea salt. I used the Food Saver and did 1 cup bags. I just put these on a shelf in my root cellar. One day I noticed a trail of white dust...the mice had eaten through about 5 bags! A tiny bite here and tiny bite there. I never thought they would go after SALT! So now EVERYTHING is stored in plastic tubs. They also got into the oatmeal, the brown sugar, a box of couscous. Nothing is safe! We also bought a bunch of old fashioned mice traps. Got every single one of them, baited with bacon. Don't forget to stock up on mouse/rat traps! The Decon was awful - the mice crawled in between the walls and died. The stink lasted three weeks. We got our food-grade plastic bag liners from Eagle Peak in Athol, ID (http://epcontainers.net/). They're not expensive and you can call in an order. At any rate, you commented on how much you like wild rice and stock up on rice in general. I live in Fl and finding wild rice, is like trying to find a polar bear in these parts. Or, if you do find it you will have to shell out $5.00 for 6 ounces! I was wondering if you might recommend a place on-line that I could place an order for some bulk wild rice that is somewhat reasonable. I adore wild rice but I'm the only one in our family who does, so I haven't bought it in bulk (like I do white or brown rice). I get mine at stores that have a bulk foods section (Winco in our area) and just buy a couple pounds at a time. I do know it's cheaper than the price you quoted!! -- but I don't recall the exact price. Sadly, wild rice is indeed pricey. FOR EVERYONE but first to give a reply to JOANNA - Check your local Winn Dixie Grocery Stores - now owned by BI-LO but still using Winn Dixie name. I buy 1 lb. of Lundberg Wild Rice Blend for less than $4.00 and I love it. I know it is a blend so if you want Wild Rice ONLY go to their website - Lundberg.com and order from there or see who sells it in Florida. EVERYONE ---- This company, IMPO - in my personal opinion - sells the best Products including Organic Products. Most People make the mistake thinking they have to go to a Health Food Store to purchase Organic and other food products but that is not always true, at least not in Fl., Ca., Or., Wa. and AK. that I am personally familiar with. Many grocery stores have an Organic Section and of course the prices are up to 75% cheaper than what you would pay for the exact same item at a Health Food Store. I have belonged to a Food Coop in my city since 1973 - and it is 2 blocks West of the Atlantic Ocean so do not think they are only out of town or in rural areas. I paid $75.00 for a Life Time Membership for my parents, my sister and myself - which was a lot back then - but years later they did away with the Life Time Membership and charged $75.00 per person per year. I pay 25% over their wholesale cost and if I work 4 hours a month, I only pay 15%. So the savings have always been fantastic. I only buy and use King Arthur Brand Flours - Non-Bleached and No Bromates Added, etc. just pure Flour. 5 lbs. is less than $4.00 at Winn Dixie but over $12.00 at most Health Food Stores. ALSO - EVERYONE -- look for Food Coops, Farm Clubs or Other Food Buying Clubs in your area - Florida has them in just about every city. http://www.pickyourown.org/index.htm#states Also GOOGLE -- truck farms and your state name. RODENTS AND PEST CONTROL - 1. buy FOOD GRADE Diatomaceous Earth - IMPO - best that is 99% PURE is from Perma-Guard and you can buy 50 lbs for $53.98 with free shipping on Amazon dot com for the same total price costing $ 49.99 PLUS $ 3.99 Shipping for total of $53.98. I suggest ONLY buying this brand name - no matter who the seller is - buy it from the seller who sells it for the best price. YOU MUST ALWAYS WEAR A DUST MASK and Rubber or Nitrile Gloves or other Plastic Gloves when handling ANY brand of DE because it will dry out your hands and the Dust is bad for your lungs. Even though you can eat it, drink it, etc. which I do. I sprinkle it in front of all entrance doors to home and all over yard, on my precious dog, etc. I usually share half of the bag with my sister but also use it up adding to food items like PATRICE LEWIS explains in this Blog Posting. 2. BAY LEAVES will keep all rodents and pests away. And of course, now I cannot find the other Leaf that also keeps them away - BUT both of these end up costing a lot when you have to add several to each bucket, barrel, drum, vacuum sealed plastic or paper bags, etc. and to place around your storage area on top of shelves and on the floor, etc. - as long as you have no pets that will eat them - which I am sure would be a problem. LISTEN TO - PATRICE LEWIS - and read her blog posts etc. She mentioned buying Oxygen Absorbers at a Mormon Cannery. You USUALLY do not have to be a Mormon to purchase from their online store or from their stores in most large cities. I spent hours on this site reading all of their fantastic info. on Food Storage, etc. http://store.lds.org/webapp/wcs/stores/servlet/StoreLocationsView?catalogId=10557&langId=-1&storeId=715839595#United-States BUT - I suggest below to GOOGLE to find more in your State then is listed at this site. Booklet on Essentials of Home Food Storage - storing food for 1 year, etc. - which is on back order but you will get it as soon as they come in if you pay in advance or call your local Mormon Temple or Church Store and ask if they have it. I suggest everyone to also GOOGLE - Mormon Stores and your State Name and also GOOGLE - Mormon Cannery and your State Name. This is how I found 4 locations in my State whereas the above Mormon site for Store Locations only listed 1. Now some articles, sites say these stores etc. are Perks of being a Mormon and belonging to the Church of Latter Day Saints - LDS - usually called the Mormon Church. So call first before going to any such store. If that store sells to LDS Church Members only - I suggest you find a co-worker, neighbor, friend, etc. that you know who is an LDS Church Member and see if they will purchase items for you. I just know the ones I called in my State of Florida are open to the general public and I will call again before going to the LDS Cannery close by me. Just my two cents worth in sharing my personal life experiences, education and spending thousands of hours researching, etc. I am giving PATRICE LEWIS permission to publish an email for me - even though I do not have a blog and this email name includes the word blog. Just have not got around to doing that as I have been writing up my experiences, etc. instead. I do not know if me, as a reader, etc. we are allowed to just add email address to her blog here. Joanna - I GOOGLED - bulk wild rice Florida - and found several sites. IMPO - the best price I found so far is for Jumbo Wild Rice OCIA Certified Organic and 10 lbs. is $69.00 or $7.30 per lb. for smaller amounts. Shipping for 10 lbs. is $23.69 and for 1 lb. is $5.18 to most Florida areas - and of course the NON Organic Wild Rice and the Culivated Rice which is NOT Wild is cheaper. But this is a great price for - Hand Picked, Certified Organic Wild Rice - it usually costs $18.00 per lb. plus shipping - if you cannot find it locally. Thank you for the information & email address. I'll keep an eye out for a good source on-line. Thanks again. Have always used my vacuum sealer for keeping the leftover from my kitchen garden fresh and useful for even a whole week, this idea of keeping the dough of cake or cookie is great, thanks a ton! Thank Patrice for this fantastic post! Storing food with vacuum sealer make my life much better from now on. Your explain is outstanding for my kitchen. Thank you, Anonymous! Waiting for the next sharing!